Whilst the new commercial development scene may be subdued, specialist contractors are seeing healthy demand for construction work on fit outs and office refurbishment. The sector has been buoyed up by a series of major refurbs of government offices. Some large private sector groups are also investing to update and modernise their commercial space. Overbury and Morgan Lovell, part of Morgan Sindall Group, one of the leaders in the sector, recently reported a 13% increase in revenues at its fit-out division to £831 million and a record profit of £43.8 million, which was above its target range. But the competitive nature of the sector was reflected in an unchanged margin of 5.3%. The average value of Morgan Sindall’s fit-out enquiries received last year was £2 million and around three quarters of its projects involved refurbishing office space which was currently being occupied. But the company has also seen a number of large new office construction fit outs. Other firms are seeing demand too, with major new projects started over the past year including 220,000 sq ft of space at Royal Dutch Shell's new multi-story office in London (Project ID 11240806), a 27-storey fit out at the nearby Shell Centre tower and a 155,000 sq ft fit out at BBC Cymru Wales' HQ in Cardiff. The need to reconfigure and modernise central government offices is emerging as a key source of construction-related work for fit-out specialists. 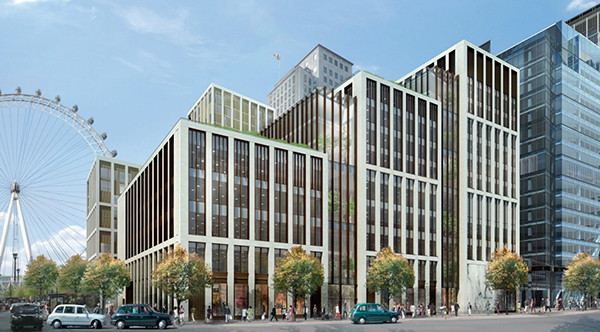 Tenders are currently being invited for a £16 million office refurbishment and fit out at the Dept of Transport’s London base at Horseferry Road, where work is set to start in summer 2019 and continue for 18 months (Glenigan Project ID: 19067415). In the UK regions, HM Revenue & Customs is proving a significant client. Tenders have been returned and construction work is set to start this coming August on a £20 million fit out of the HMRC Government Hub in Edinburgh and continue for nine months, with Turner & Townsend acting as project manager (Glenigan Project ID: 18391814). Tenders have also been returned on a £20 million fit out at HMRC’s Cardiff office with work set to start in July and continue for 20 months (Glenigan Project ID: 19067476). Meanwhile, bills have been called on a £7 million office refurbishment of two offices for the Hon. Society of the Middle Temple in EC4, which is set to get underway in autumn 2019 and continue for 18 months (Glenigan Project ID: 18193317). Growth in the hotel sector is also creating a healthy pipeline of fit out and refurbishment projects across the country, according to Styles & Wood, a major player in the sector. The firm is benefiting as boutique hotels seek to include bars, spas, gyms and restaurants on their premises. Styles & Wood also believes refurb activity by the budget hotel sector is set to pick up. The firm is seeing budget hotel chains such as easyHotel and Yodel spending more on improving rooms in a bid to create distinctive spaces.